There’s no season more magical than the Christmas one and the best way to get into the mood for Christmas is to start the holiday season with a visit to a Christmas market. Belgium has to offer some of the loveliest Christmas markets in Europe – warm Belgian waffles, mulled wine and Belgian fries are just a few of the treats that can lure you there. Well, the Christmas markets in Belgium are not only about food, although that’s enough of a reason to visit at least one of them. Most of them have special events organized, like lights shows, skating rinks or performances, and of course the irresistible Christmas atmosphere of the Christmas stalls (called ‘chalets’ in Belgium) where you can find anything from Christmas tree decorations to gifts and handcrafts. And what’s the best part about the Christmas markets in Belgium? Unlike the traditional German Christmas markets, the most Belgian ones are open even after Christmas! Isn’t that just a perfect way to spend those precious free days around Christmas! Here’s my selection of the most iconic Belgian Christmas markets. Unfortunately, I haven’t visited them all myself, which I still have time to rectify, so I have asked fellow bloggers for their recommendations. Antwerp is my go-to city if I want to have a quick day trip and I can’t hide it’s one of my favourite cities – lovely architecture and lots to do and see. Christmas in Antwerp is no exception! The fairy Christmas stalls with festive lights start at the square in front of the Steen Castle and continue further on Suikerrui to Grote Markt and up to Groenplaats. About 100 vendors offer at their chalets irresistible Belgian treats like smoutebollen (a sort of a deep-fried doughnut) and the all-time favourite mulled wine. Do not miss the famous spekpatatjes (potatoes with bacon) when there! There’s a gigantic skating rink on Groenplaats where you can work on your Rittberger or triple Axel or just skate for fun if you aren’t a skating star (which I am not either…). Not a skating fan at all? Then you can work on the jenever in the winter bar! Need more winter fun? Head to Koningin Astridplein (it’s a bit off of the historical centre) for a gigantic slide down the tubing slope. And if you happen to be in Antwerp with your loved one, head to Grote Markt. Why, you may ask? Well, because the 200 square metres of mistletoe are just an opportunity not to be missed to kiss your loved one. OK. Enough with the cheesy stuff. My favorite thing to do in Antwerp at the Christmas market is to get on the Ferris wheel. There isn’t more magical view on the city than looking from a height of 50 m down and across to the city bathed in Christmas lights. What about a short getaway to Antwerp? Check out here for the best hotel deals in Antwerp. On any given day, Brussels makes a strong case for being one of the best places on earth. Known for the world’s greatest frites, waffles, chocolate, and beer, Brussels has all the good stuff. At Christmas time, Brussels goes a step further by introducing amazing Christmas markets. Open from December until early January, the Brussels Winter Wonders and Christmas Markets are a must-see for any traveler. Over 200 little chalets selling delicious food, Christmas gifts, and warm mulled wine like the streets of the old town. For over 2 km, twinkle lights decorate every road. You can always hear cheery holiday music somewhere in the distance. It’s safe to assume you will eat a ridiculous amount of frites, waffles, and other traditional fare as you explore the Christmas village. In the evening, everyone walks to the Grand-Place for the nightly light and music show. In the days leading up to Christmas, there are choir performances, late night museum openings, and free concerts around the city. All the while, you are only steps away from a delicious Trappist beer or steaming mug of hot chocolate. This holiday season, don’t miss the Brussels Christmas markets and festivities. What about a short getaway to Brussels? Check out here for the best hotel deals in Brussels. The Brussels Christmas market has been recommended by Nicola Rae from See Nic Wander. You can follow her adventures via her Instagram or Facebook page. 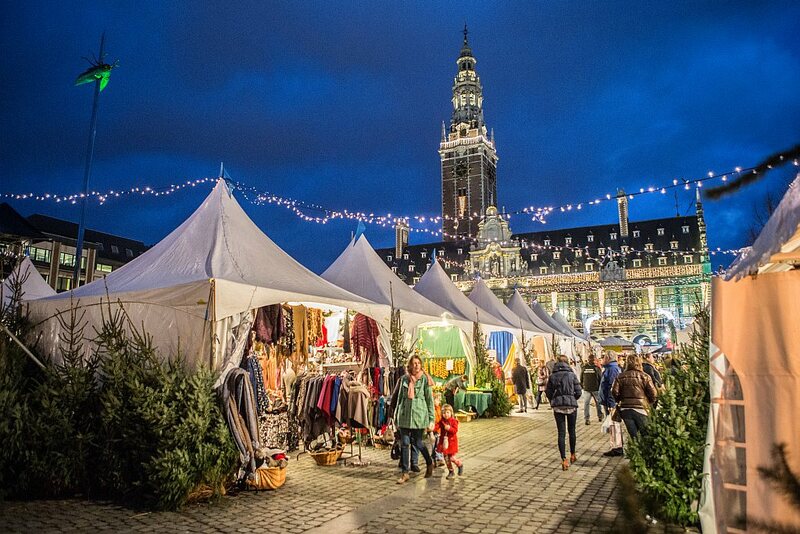 The Christmas Market in Leuven is one of the oldest in Belgium. It has also been chosen as the cosiest market in Belgium. The atmosphere in the market is much more intimate than in bigger cities. There are 140 cute white stalls to discover in the heart of the city, Monseigneur Ladeuzeplein and Herbert Hooverplein (next to the University Library). They sell mostly handicraft items, Christmas and other small decorations, clothing, gifts, festive food and delicacies. The place is magical in the night when the stalls are illuminated from inside. The beautiful historical buildings and streets are also decorated and lighted. The aromas of traditional delicacies and Christmas music will get you even more in the festive spirit. You can enjoy glühwein, jenever gin and traditional festive treats, like waffles and smoutebollen in pop-up bars. Make sure to visit Father Christmas in his cottage. Children would love a ride in the old-fashioned carousel. On some evenings you can marvel views from the University Library tower. (In 2018 on Fridays Dec 7, 14, 21, 28 and Jan 4 between 5 PM – 9.30 PM. Ticket price is 5 euro. There is a balcony, and you can see the whole Christmassy city from there! Leuven can easily be reached by a train from Brussels in around 30 minutes. There are good train connections from other main cities as well. The Christmas market is only a 10-15 minutes walk from the train station. Parking space in the city is limited, so public transportation is recommended. What about a short getaway to Leuven? Check out here for the best hotel deals in Leuven. The Leuven Christmas market has been recommended by Jemima from All other colours. You can follow her adventures via her Instagram or Facebook page. The town of Bruges is unanimously crowned as one of the most romantic towns in Europe, and the Christmas market there just contributes to the amazing atmosphere of this gem of a place. As it happens with most beautiful places, Bruges tends to be very touristy and you might find it a bit crowded during Christmas season. Nonetheless, it’s very pretty with all the buildings lit up on the Market Square (Grote Markt) and the skating rink in the middle with the Christmas stalls around it. One of the best attractions to visit in Bruges during the winter season is the Ice Sculpture Festival – a real winter wonderland of ice complemented by the magic of light and colour! If you visit Bruges during the weekend, you should be aware that there could be some waiting involved with visiting the festival, as it’s a pretty famous attractions. We visited the Christmas market in Bruges on one of those cold days when the icy wind shows no mercy to your face and the freezing rain gets through your jacket into your bones, so we even didn’t bother queuing to enter the Festival. Instead, we snuggled up in one of the cafés with a cup of the hottest and most delicious hot chocolate ever. What about a short getaway to Bruges? Check out here for the best hotel deals in Bruges. Do you want to visit this year’s European Capital of Christmas, then you have to head to Wallonia in Belgium. The city of Liège will be proudly wearing the crown of European Capital of Christmas for 5 weeks in 2018 and for a reason, as the Christmas market in Liège is the oldest and the biggest one in Belgium. And it’s not just a simple Christmas market, it’s a whole Christmas Village, with its very own Post Office and post stamps! This year there will be even a small train that will connect the various attractions in the Christmas Village. The traditional skating rink, the Ferris wheel and the toboggan run aren’t missing, as well. If you want to buy a unique souvenir, than you should look for the hand blown glass decorations. Of course, when in Liège, you have to try the famous Liège waffles, which are not to be mixed with the Brussels waffles. For the differences between the two, read this article. What about a short getaway to Liège? Check out here for the best hotel deals in Liège. Not yet sure which Christmas Market to choose? Pin this for later! Which Christmas Market in Belgium are you going to visit this year? I have already made my choice. I’ll be heading to Leuven. I haven’t been in Leuven at all, so I would love to discover the city!